A jet boat whizzes up the main channel of the Salmon River after leaving Vinegar Creek boat ramp near Riggins, Idaho. Alan and I are cruising along with another couple for the hour ride to Mackay Bar Outfitters & Guest Ranch. The boat slows down to maneuver beyond a group of rafters and then slows down again when Buck Dewey (jet boat driver and co-owner of Mackay Bar Ranch) spots a black bear lumbering across the hillside. And then there’s the turn into the rapids and the big “whoo-hoo” from us as a wave of water sprays over the boat. Wild West scenery accompanies a jetboat ride on the Salmon River. We’re on our way to experience life off the grid in the Frank Church-River of No Return Wilderness—at 2,366,757 acres, it’s the largest contiguous wilderness area in the continental U.S. And I know what you’re thinking. How did Donna (the travel princess) and Alan ever get here? Exploring the Salmon River by raft. (I’ll take the jet boat ride and accommodations at Mackay Bar Ranch). Reading local news articles, I noticed stories about private in-holdings in the wilderness, complete with off the grid, rustic lodges. Mackay Bar Outfitters & Guest Ranch is one of them. Alan found Mackay Bar during one of his travel dreaming Internet searches, which happens quite often at our house. After several telephone conversations with Joni Dewey (Buck’s wife and co-owner of the ranch), we were able to synchronize our trip with that of another couple to share in the cost of jet boat transportation to and from the ranch. The cost for one couple is prohibitive. 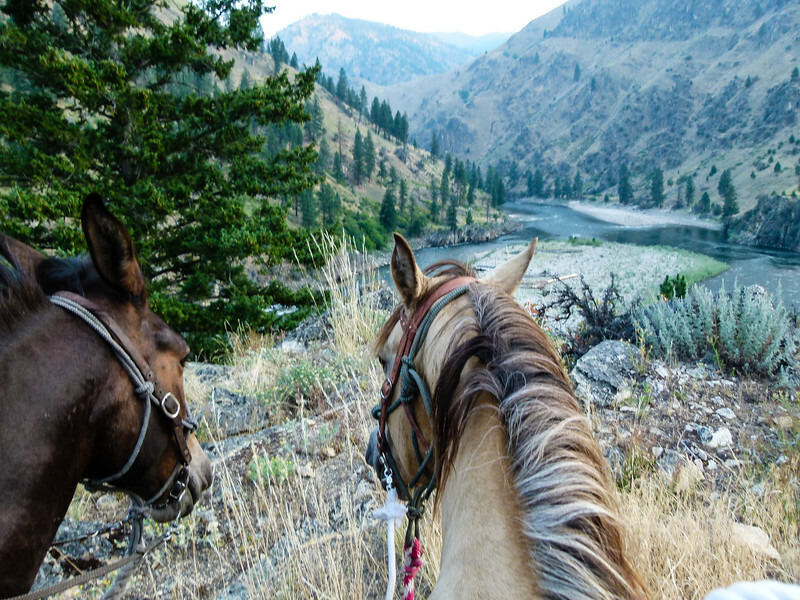 Mackay Bar Outfitters & Guest Ranch caters to group adventures. I recommend finding 4 to 6 like-minded boomer friends for a trip worthy of any bucket list. So that’s how we found ourselves stepping onto the sandy beach at Mackay Bar to spend two nights in the Frank Church Wilderness, about as far off-the-beaten-path as you can get. 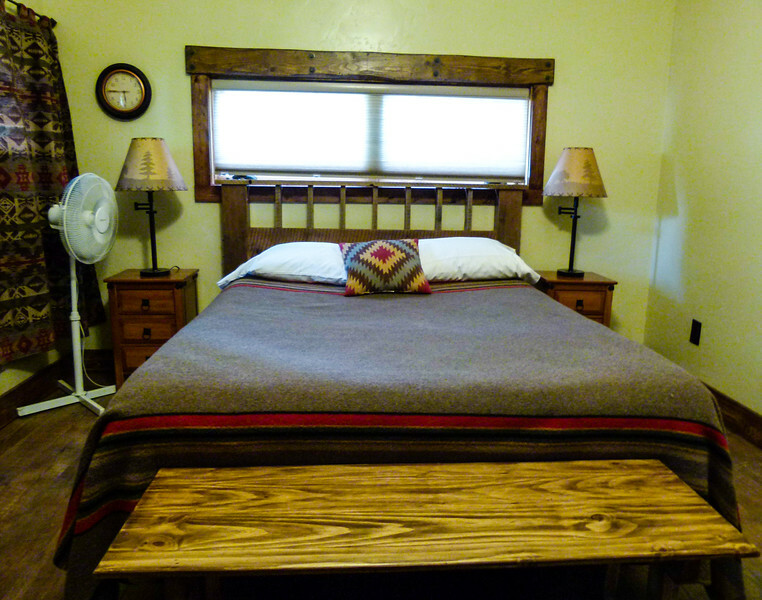 Cabins at Mackay Bar Ranch are decorated with attractive rustic furnishings. Our log cabin may not have been luxurious but was more than comfortable and well decorated with rustic furnishings. The cozy accommodations included a queen bed, an alcove with a twin bed and a bath with pretty copper sink and a shower. A narrow ladder led to a loft with two more twin beds. Being off the grid, there is no air conditioning but we stayed comfortable on a warm, July visit by closing the blinds in the morning and using an electric fan to cool off in the late afternoon. Guests also have the option of staying in a room with a private bath or a wall tent with private outhouse. Power is generated by hydro and usage is limited but adequate. Wifi is also available but sporadic as well. But who needs to be online with wild nature just outside the window? Chairs on the beach at Mackay Bar Ranch. It’s a great spot for a drink at sunset. 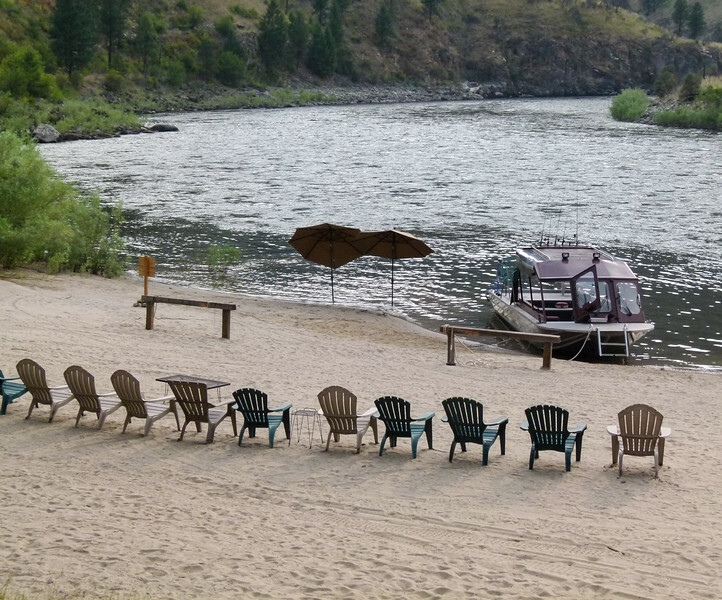 After a day of exploring, guests play volleyball on the spacious lawn or enjoy watching rafters in the river from comfortable beach chairs planted on the sandy beach. A deck with shade break and tree canopy is stocked with cookies, tea and water for an afternoon of relaxing. Appetizers are served here before dinner along with wine or beer. Meals are served family style in the main lodge. Alan and I enjoyed dining with a rafting group one night. They traveled on the river during the day with stops at historic lodges at night. We listened to their adventure stories over chicken cordon bleu, marinated slaw, baked beans, potato salad and the best bread pudding that I’ve ever tasted. 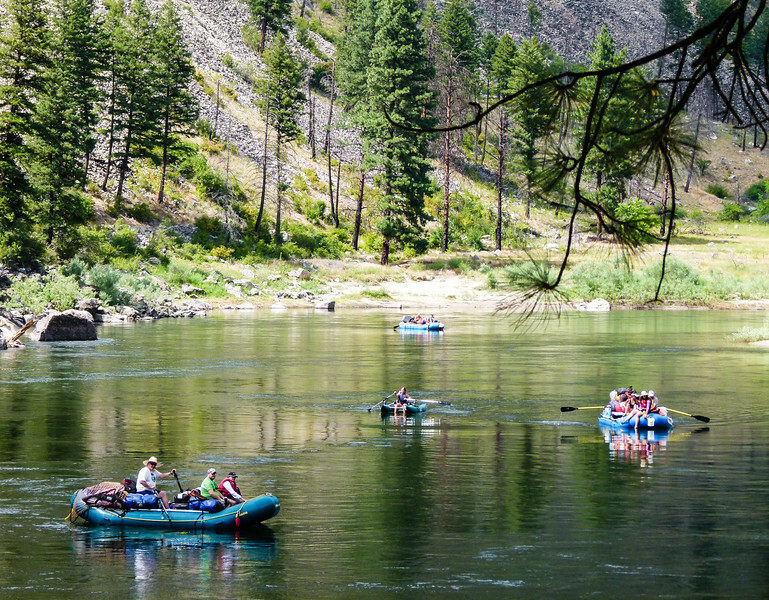 I was impressed enough with Wayne Johnson’s river adventure to include Salmon River Rafting Company in my article, Four Off-the-Beaten-Path summer trips. Alan’s horseback view at Mackay Bar Ranch. 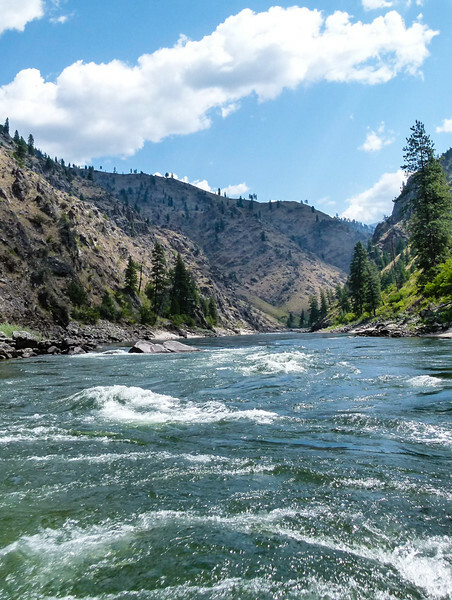 Our stay at Mackay Bar Outfitters & Guest Ranch included a day of jet boating up the river to explore historic sites in the Frank Church Wilderness. And Alan enjoyed a horseback ride with Buck Dewey the morning before we reluctantly zoomed back down the Salmon River to civilization. This is a boomer travel experience worth repeating. Next time, Alan and I are thinking about contracting with the mail plane to fly into the airstrip at Mackay Bar Ranch. Or there’s the option of a long ATV ride through the forest. I bet you can guess which is Alan’s choice. Me? I’ll pick the plane. Do you have off-the-beaten-path summer trips to recommend? Come join the conversation at the My Itchy Travel Feet page on Facebook. Or send us an email with your thoughts.